Like a man, a woman has many roles in life. However, being a wife is her primary role under God. This is the reason she was originally created. This means that the role of a wife is more important than the role of a mother. The role of a mother is vital, but it grows out of and is under the ministry of being a "help meet." This does not mean that a single woman is incomplete. If God asks an adult woman to remain single - either for a season or permanently - in a special way, He becomes her Husband. So what is the ministry and role of a wife? She is called to be a helper to her husband. Her husband cannot accomplish his God-given mission without her. She is a vital part of the team that God placed together in a Christian marriage partnership. She should be aware of the vision God has given her husband and her place in it. A Godly woman has her place of authority and honour in bringing God's vision to pass in the sphere of influence in which He has placed them. She is to be a counselor. She is to give her husband sound, Biblical advice. Eve acted as a counselor, which was her role, but she gave evil advice. Adam knew the advice was wrong, but he followed it anyway. The same thing happened with Ahab and Jezebel [1 Kings 21:25]. A woman can have a great influence on her husband's decisions for better or worse. Sometimes she may not be able to explain to her husband why she thinks a course of action is right or wrong. A husband should always take the advice of his wife seriously. Many a husband in pride has ignored his marriage partner's "feelings" to great financial or personal loss. God spoke to a wife-to-be, Mary, about the coming of the Messiah before He spoke to Joseph. We see the same thing in Judges 13. The Angel of the Lord came and spoke to the wife before her husband. In Judges 13, Manoah was fearful because of the revelation of God. His marriage partner was able to logically answer her husband's fears. As a counselor, a wife should be careful to maintain her relationship with God and knowledge of the Word of God. [The husband, of course, should also have a priority of knowing God as he is directly under Christ.] Many times a women is more spiritually sensitive [Matt. 15:28]. That is a blessing...but also a danger - which is one reason why she must submit to her husband. She may also expand her knowledge by studying specific areas that her husband is likely to need counsel. A wife is also a helper. She assists her husband to accomplish God's mission for their lives. She has authority under her husband. The two marriage partners are to be united in one purpose - serving Christ in whatever way He was designed. Proverbs 31 is the classic picture of a wife in the position God has designed for her. It should be noted that every one has different talents and abilities. The idea is one of partnership, hard work, and diligence, not that every wife should be a real estate agent or business woman. What are some quick points we see about this honoured marriage partner? 1. Vs. 10 She is more valuable to her husband that any other person or thing on the planet. Many a husband has lost his marriage partner or hurt his marriage because he has failed to appreciate the wonderful gift from God that she really is. A Godly woman is a treasure to be sought [Pr. 12:4, 18:22, 19:14]. If a woman wants a Godly husband she should make sure she is the kind of Godly woman that such men seek for. 2. Vs. 11-12 She is trustworthy. Her husband can go to work or look after other matters of life, confident that his marriage partner is competently and diligently working for their mutual benefit. No matter what she is doing, he knows that she is doing her best and not wasting her time or their resources. 3. Vs. 13, 19, 27 She is not afraid of work to provide for her family. If she is not talented at making clothes, she may search the second hand stores for good quality clothes for her family. New things are nice but, especially if funds are tight, she is creative at getting the best for her husband and family at reasonable cost. 4. Vs. 14, 18 She knows where the food and other sales are. She also knows if it will cost more in gas and time than the savings for traveling from store to store. She knows how to find nutritious food to keep her family healthy. 5. Vs. 15, 21 She is diligent to look after everyone under her care. She is concerned that they are treated fairly. 6. Vs. 16, 24 She has a good business sense. She knows what she can do to turn a good and fair profit. She may operate a home business, plant a garden, or do any of a million other things to help and strengthen her home. 7. Vs. 20 She is compassionate and willing to help those in trouble. She is not so wrapped up in her husband and her family that she cannot see the needs of others. She can see the big picture and the place of her family in it. 8. Vs. 22 She does not neglect herself. She knows how to care for her appearance and dress beautifully. 9. Vs. 23 Her husband is a well-respected man of honour. He is known in his area of influence as a wise and trustworthy man. 11. Vs. 28-30 Her children and her husband respect and admire her. 12. Vs. 31 She has earned many blessings and rewards and should be allowed to enjoy them to the fullest. A husband should be delighted when his wife receives recognition and praise. This is sometimes used as a tool to manipulate and control. What does God really mean by submission? Does this mean she is a servant - or a slave - to her husband's whims? No. The husband is to be in submission to Christ and His Word. [There is never a time when any human being is not to be in submission to someone!] The wife is a co-ruler with him. They are a team, a partnership for building the Kingdom of God. God designed them to be interdependent [1 Cor. 11:11-12] not independent. The female marriage partner is like the Vice-President. She has her realm of authority under the direction of her husband. God has a line of authority and her husband is ultimately responsible directly to God for everything that goes on under his care. It is team work; however, someone must have the final say and responsibility. God has chosen that this is the husband. His wife should recognize this heavy responsibility and help him bear it. 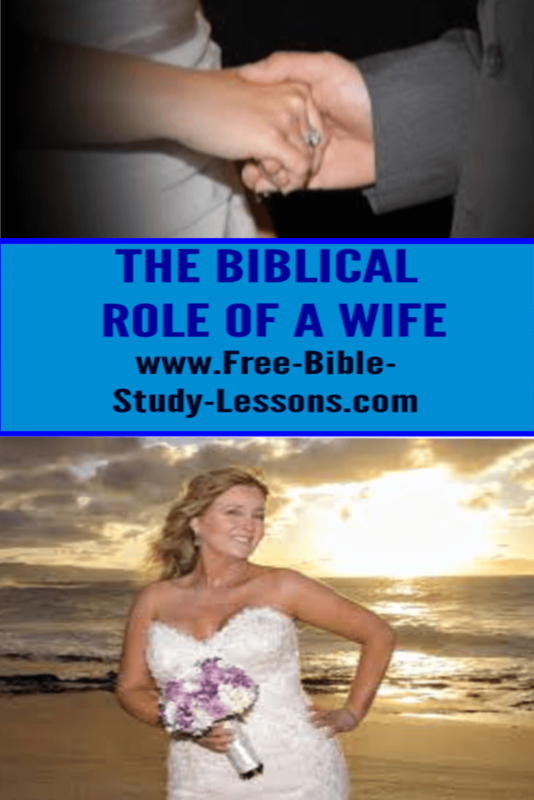 What happens if the wife is married to an ungodly man? The non-Christian husband must still be submitted to. Sometimes wives try to win their ungodly husbands to Christ by criticism, "witnessing", trying to force him to go to church, etc. Loving submission - as to Christ - and a Godly lifestyle are the best witnesses. Only if the husband is committing a Biblical divorce offense does that become an option. [See Divorce: God's Protection For The Innocent]. No woman is required to be submissive to an abusive husband. Note: The many teachings of Scripture on how Christians are to treat each other have a special application to marriage.